You can type values to position your elements using exact coordinates. Separate to independently edit the different coordinate fields. Continue to step 3. 3D Path to use a 3D path function when animating your element. Continue to step 4. In the (x), (y) and (z) Axis fields, type in a new coordinates corresponding to the desired position—see About Multiplane. Use the Function buttons to create function curves and add keyframes to animate the parameter. Locked to resizes the element uniformly in three directions. Separate to resize the element in any direction without affecting the others. 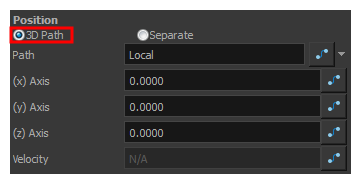 For detailed information on the Layer Properties parameters, see Drawing Layer.